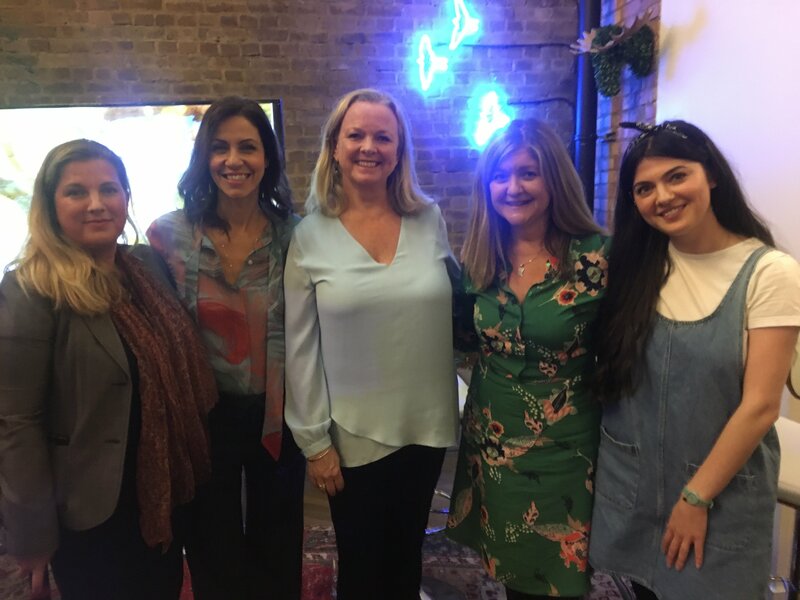 It was great fun to be on the panel to talk all things Australia for Nat Geo Traveller Travel Geeks event. I was the only Australian but the rest of the panel really knew their stuff from many, many visits over the years. Australia with Julia Bradbury is on ITV in the UK now and doing incredible numbers. I was delighted to dispel any old-fashioned views about food and share my love of Australia with the 80 people in the audience. Aside from that, we’ve had our last dinner party in the UK until I return and I am on a flight on Thursday morning to go to Singapore for the weekend with my daughter and family. So not quite sure when I will send this – and the April newsletter will have to wait. 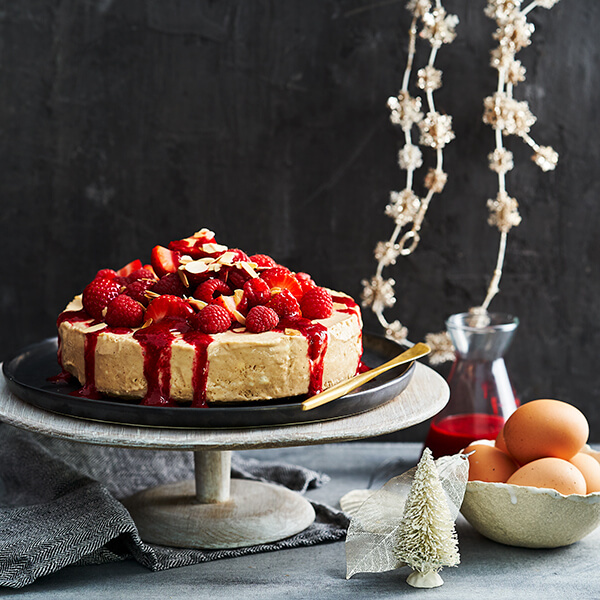 Next, I’m looking forward to The Easter Show – I’ll be on in The Australian Women’s Weekly Theatre Kitchen every day from 3pm – 3.40pm and in a first, we are judging Oysters and Prawns in our Sydney Royal Aquaculture Competition there on the first morning of the show. So, if you are in Sydney, come on by and say hello. Bite into a new season apple. Select from Jazz, Kanzi, Royal Gala, Golden Delicious, Red Delicious, Bonza, Fuji, Grannyand Pink Lady. To maintain the juicy, crisp, texture of apples at home, remember to store them in the refrigerator. This apple & coconut slice is delicious served hot or cold. Pomegranates are available mid-autumn until late winter. The dynamic colour, tangy nectar and abundant seeds of the pomegranate have made it a symbol of love and plenty. It is only the sweet – tart flavoured seeds and juice that are edible. 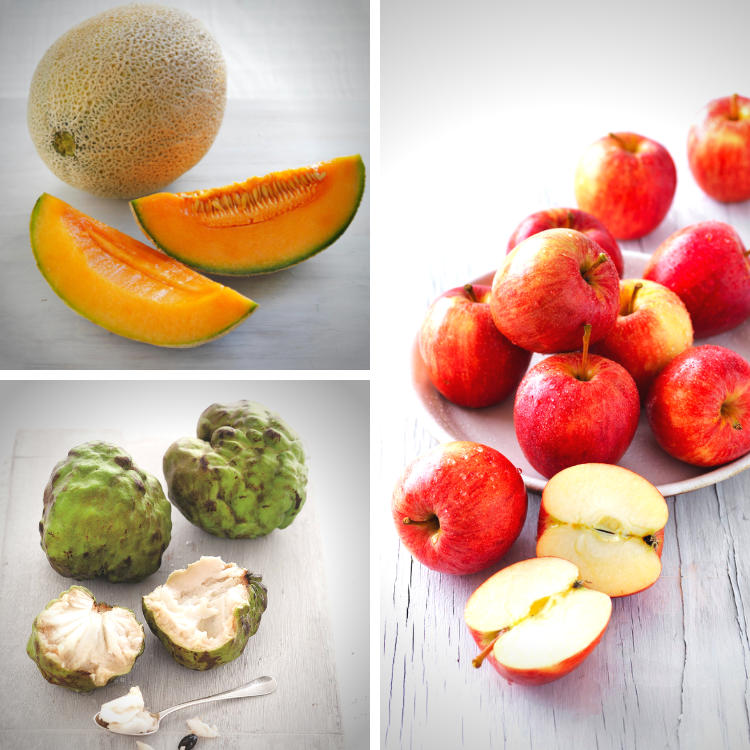 There is a good supply of flavoursome, inexpensive and good eating rockmelon available at your local greengrocer. It’s time to pop rockmelons back on the shopping list. Despite their creamy texture bananas contain no fat at all. Bananas make an ideal snack. Use bananas in or serve with pancakes, add to muffins and cakes or shake up a delicious smoothie. Smooth, creamy with a nutty flavour Shepard & Hass avocado are a top buy. A good source of vitamin B6, this vitamin has many functions and is especially important during exercise when it plays a role in changing amino acids into glucose to provide energy to the muscles. Try this rainbow salad with avocado dressing. If you adore olives, then try pickling our own as green kalamata olives are in season. Extra juicy North Coast grown limes are still available fso snap them up now. You can always freeze the juice in ice-cube trays. One of the most popular and nutritious members of the brassica family is broccoli, its vibrant green colour and mild flavour offering iron, potassium, vitamin C, folate and B complex vitamins. Broccoli is good value. Alternatively try broccolini this broccoli and gai lum cross has long tender, edible stems with small broccoli florets. This char-grilled broccolini with tahini chicken is delicious. 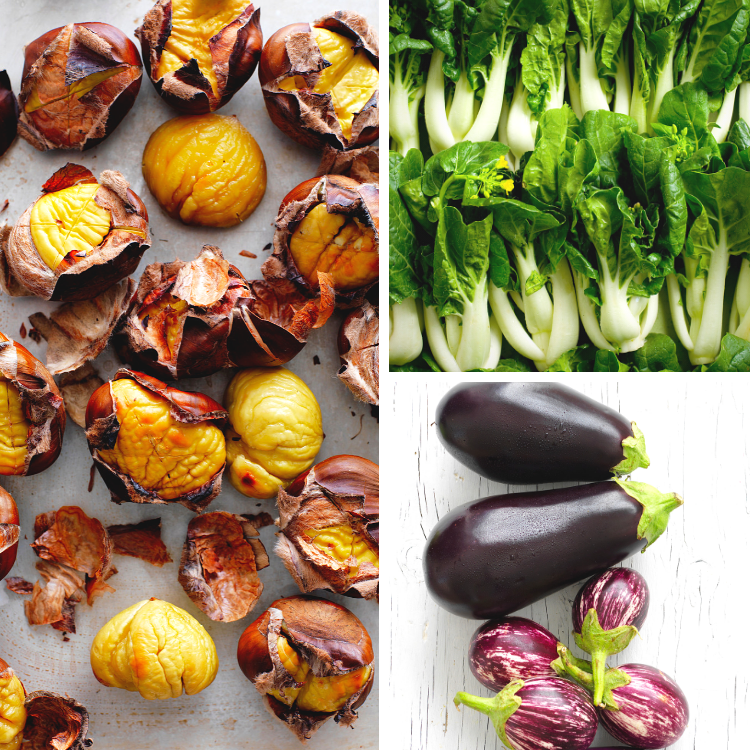 Versatile eggplants are available in a range of varieties in Autumn. Whip up a Greek feast with this crumbed eggplant with easy mint tzatziki. A delightful array of Asian vegetables can be found at your local greengrocer. Add a delicious crunch and goodness to your stir-fries by adding a bunch of choy sum or pak choy. Pop a cauli in your trolley this week and add to hearty vegetable soups or steam and serve florets coated in a cheese sauce or buttered breadcrumbs or whip up a cauliflower, leek and bacon soup. Mild onion flavoured leeks are ideal for flavouring soups, casseroles, flans, pies and vegetable dishes. Combine leeks with cheese, cream, bacon, tomatoes, potatoes and mushrooms. Try leeks as an alternative to onions, Tip: Split and fan leeks, then wash, under running water to dislodge an soil. Pick up the last of the Queensland new season ginger, it has a soft pale skin and delicate flavour. For extended storage peel the ginger and cut into chucks. Place in a clean jar and fill with, Chinese shaoxing rice wine, sherry or gin. Keep the jar in the refrigerator and use as required. New season ginger is more perishable than more mature ginger. Pick up a packet of fresh bean sprouts that are delicious added to a stir-fry, fried rice, curries, Pad Thai salad or sautéed with garlic and served as a side dish. Silverbeet with its large green gloss leaves and crunchy white stalks are ideal for adding to soups and vegetable pies or frittata. Remember to wash well before using. Try a spinach silverbeet and ricotta pie. Australian chef Neil Perry cooked this for me on the shores of Sydney harbour when I was filming my award-winning TV series cookbook, Lyndey Milan’s Taste of Australia. Remove the steaks from the refrigerator 2 hours before you intend to start cooking and season liberally with sea salt. Preheat the barbecue to hot. This could take up to 1 hour if using natural fuel or 15 minutes for a gas barbecue. Ensure the grill bars are clean. 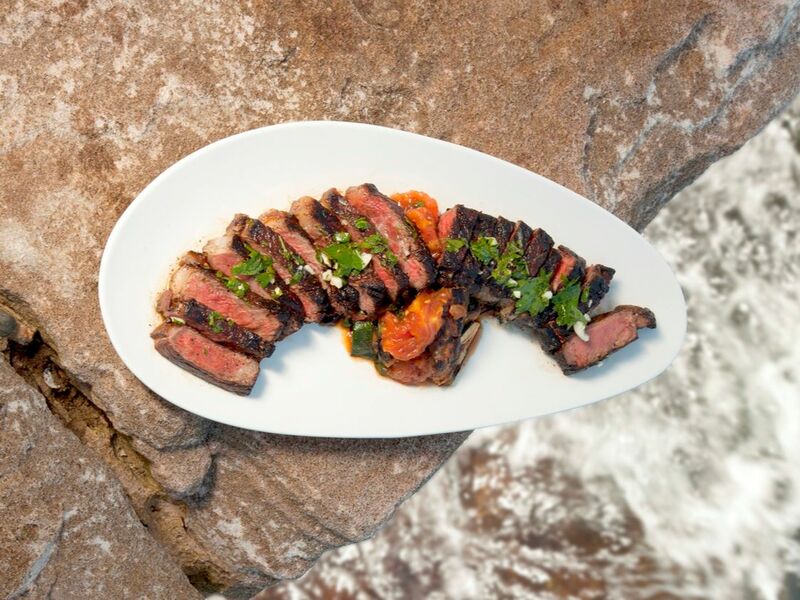 Splash the steaks with a little extra virgin olive oil and shake off any excess. Brush the steaks on the grill bars before placing on the grill at a 45 degree angle to the grill bars. When halfway through cooking that side, turn the steaks 45 degrees in the opposite direction to make nice grill marks. When done, turn them over and cook the other side. Put the steaks on a plate, cover with foil and place near the barbecue to keep warm. Rest for 10 minutes. To make the salad, make sure the grill bars are hot and clean. Brush the zucchini, eggplant and tomato with extra virgin olive oil and sprinkle with sea salt. Chargrill the vegetables on both sides until tender. Combine the vegetables in a bowl, add 1 tablespoon extra oil and balsamic vinegar and combine. Cool, then add the parsley and check the seasoning. On a chopping board with a little sea salt crush the garlic, add the parsley leaves and chop until you have a paste. Place in a bowl and add 2 tablespoons of extra virgin olive oil, season with freshly ground pepper, squeeze in lemon juice and mix to combine. To serve, slice the rested steak and place across a bed of the grilled salad. Drizzle with garlic and parsley dressing. I’m lucky to have friends in the food business in one form or another around the world. 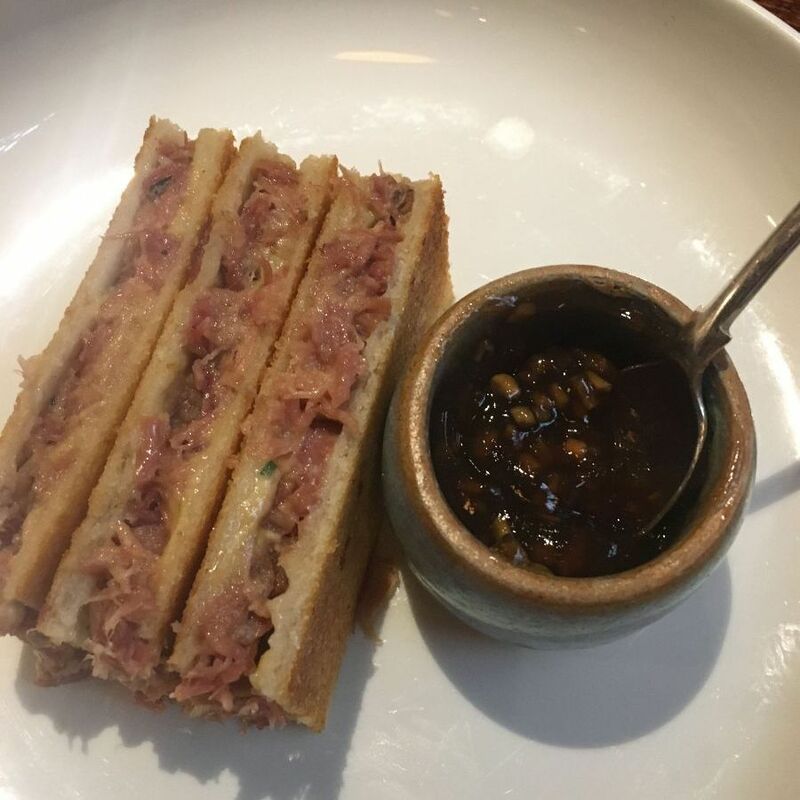 Being able to tap into locals’ food knowledge is fantastic – and there is some really good food on offer in London. 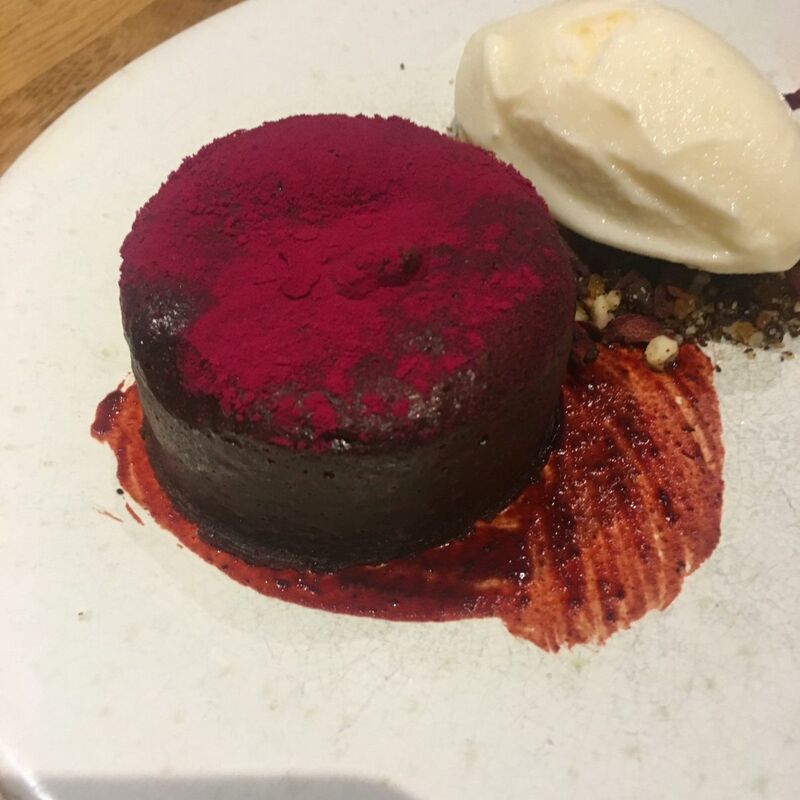 Recently two friends and I went to Cora Pearl for lunch in Covent Garden. Named after a 19th Century courtesan who started her career in Covent Garden and ended up as the Queen of Parisian nightlife. Cora Pearl now serves complex comfort food, wine and gorgeous cocktails in an historic Covent Garden townhouse. It is the sister restaurant to Kitty Fisher’s which I went to soon after it opened a couple of years ago with another food writing friend. It was named after an equally infamous 18th Century courtesan who lived nearby in Shepherd’s Market. But back to Cora Pearl, We were offered a quieter table downstairs which we were delighted to accept and shared everything, beginning with a great value Picpoul de Pinet (£29). 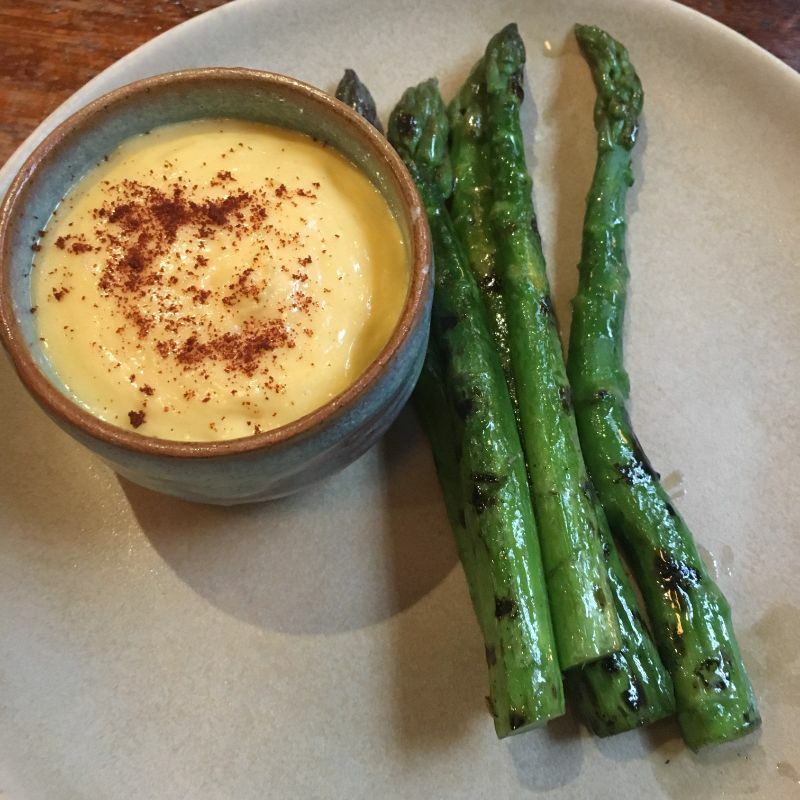 Asparagus is just coming into season and smokey hollandaise (£10.50) was a wondrous accompaniment. The deceptively simply named Ham & Cheese Toastie with pickle (£8) was like no other. More like pulled pork or ham and melting cheese and luckily cut into three. 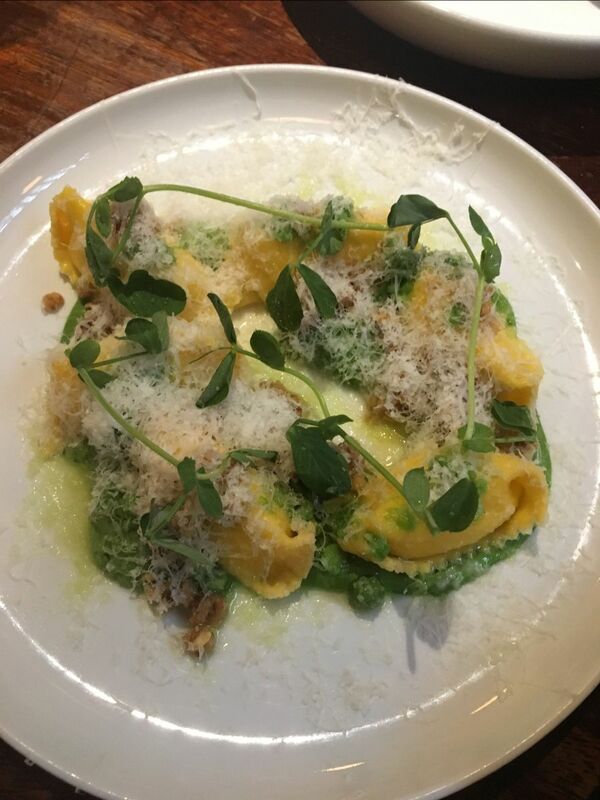 Cow’s Curd Agnolotti, Pea & Truffle (£17.25 for a large serve) was perfectly made, the creamy interior encased in house-made agnolotti and freshened with the pea shoots and a bed of crushed peas. I loved the play on the traditional “Coronation Chicken” which is cold chicken in a curry mayonnaise in the Coronation Salmon Terrine (£10). 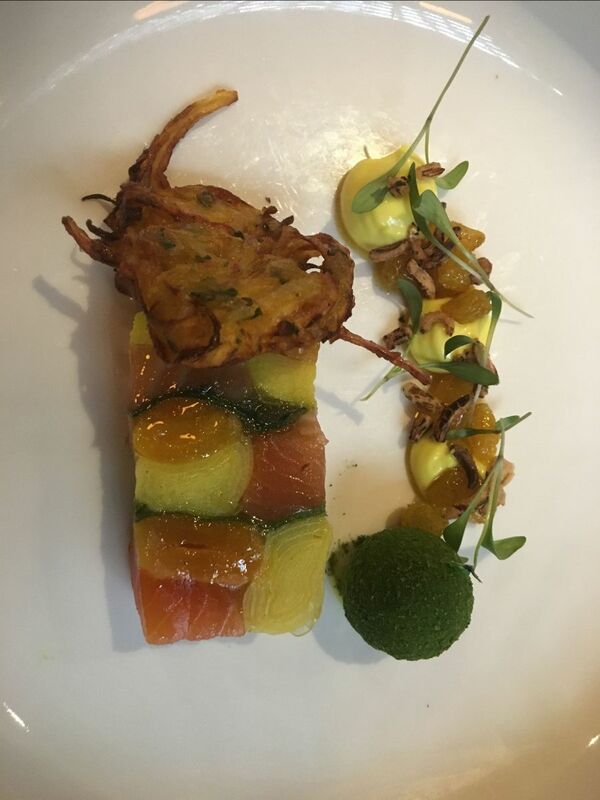 This was a beautifully constructed terrine of salmon with leeks, eschallot bhaji with dollops of curried mayo and a herbed quail’s egg on the side. A lovely salad of Watercress, Horseradish and Apple (£5) completed the savoury courses. 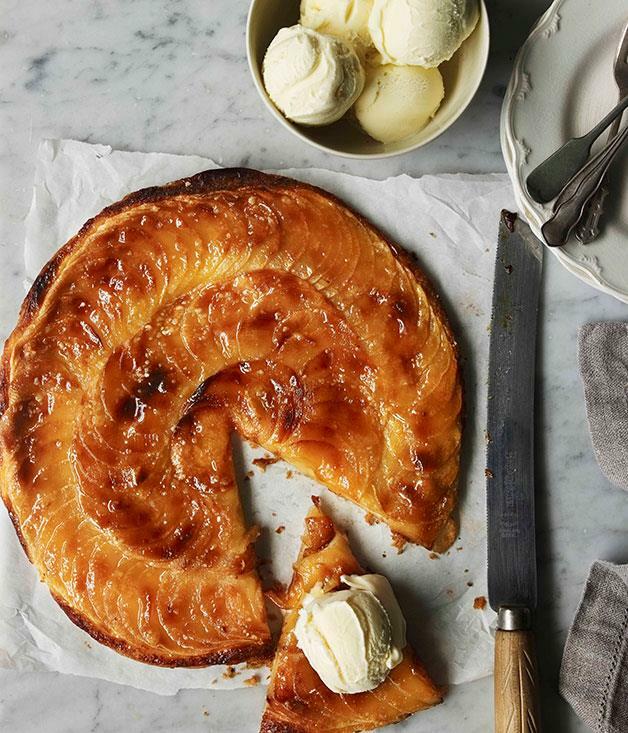 Desserts all have deceptively simple names. 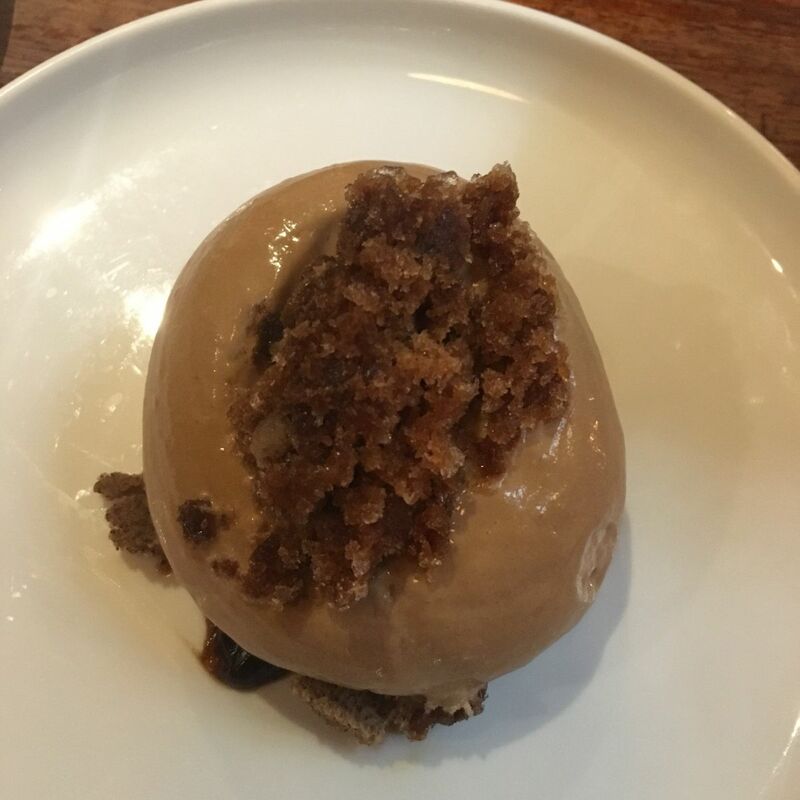 Coffee and cardamom (£8) was a rich cardamom ice cream with a coffee granita and as for the eclair (£5) – it was so good we ordered two. Enough said. Herbie and Liz from Herbie’s Spices are longtime friends and colleagues. I also co-authored a cookbook with Herbie, Just Add Spice and co-hosted a TV series, Lyndey & Herbie’s Moveable Feast. 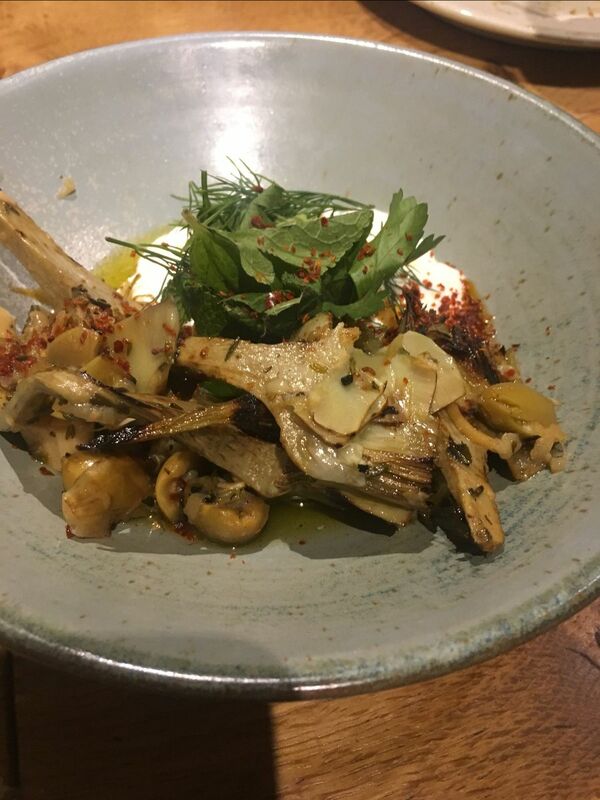 Their London-based daughter had made a booking at Rovi, Ottolenghi’s newest restaurant in Fitzrovia which serves a menu with vegetables at its heart but with a fresh focus on fermentation and cooking over fire. I was delighted to join them. It’s always fun to eat with people who like to talk about the food and what we think is in it. A great fun night and some really amazing food. Again we shared, agreeing on what we would order. Tempura stems and herbs, Szechuan, mandarin and lime leaf vinegar ( £7) was just that, crisp and non-greasy complemented by the vinegar with a hint of Szechuan pepper which tingled in the mouth for some time after. 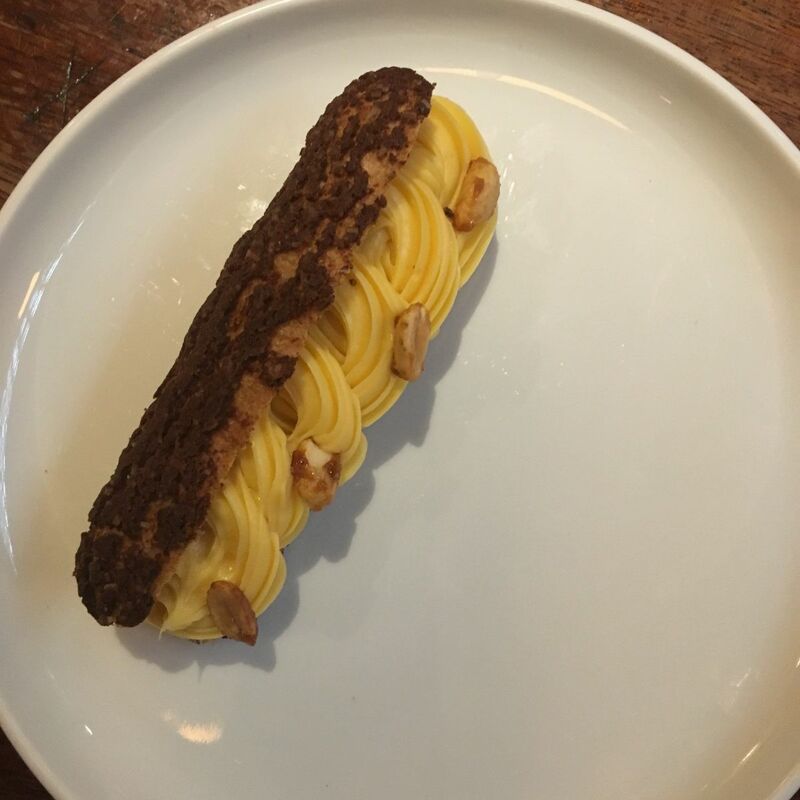 Crumpets are certainly enjoying a revival (thinking of Josh Niland’s Sea Urchin Crumpets at Saint Peter in Sydney’s Paddington). Here they were topped with lobster, served with a kumquat and chilli sauce (£8). 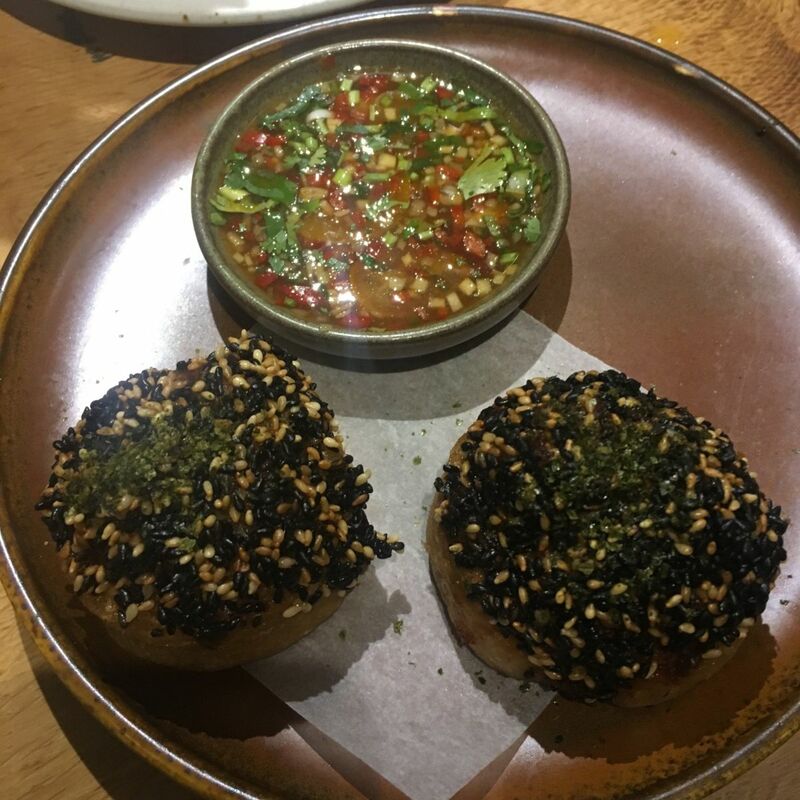 These did not disappoint, soft, spongy crumpet generously topped with lobster and black and white sesame seeds with the acid in the accompanying chilli sauce coming from cumquat rather than lime. 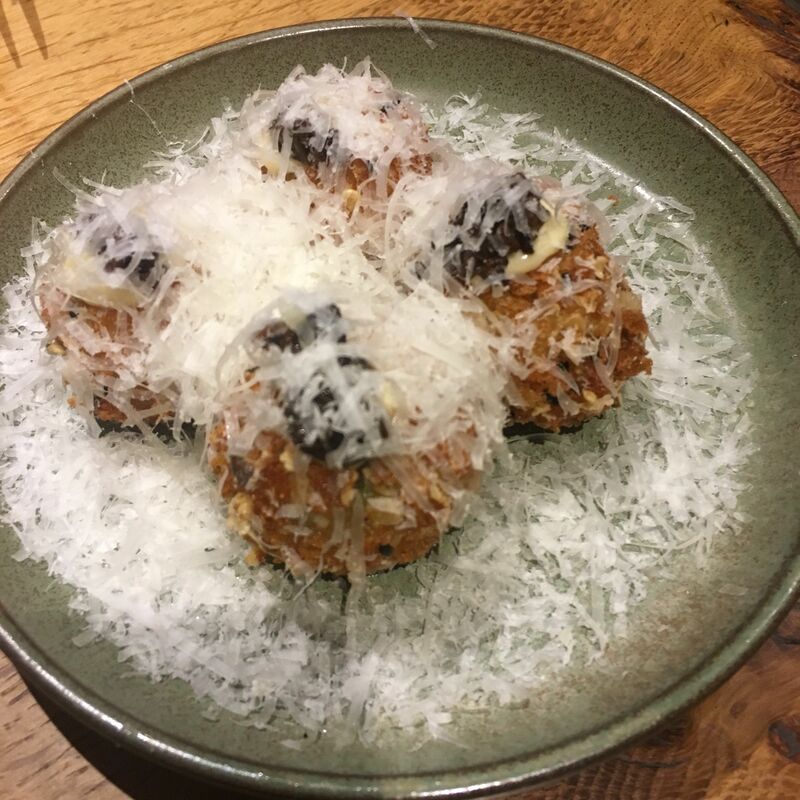 Parsnip and Pecorino Croquettes were classically made on a bechamel base, topped with smoked garlic aioli, pickled walnuts and grated pecorino (£7.5). Absolutely superb, so soft and creamy. 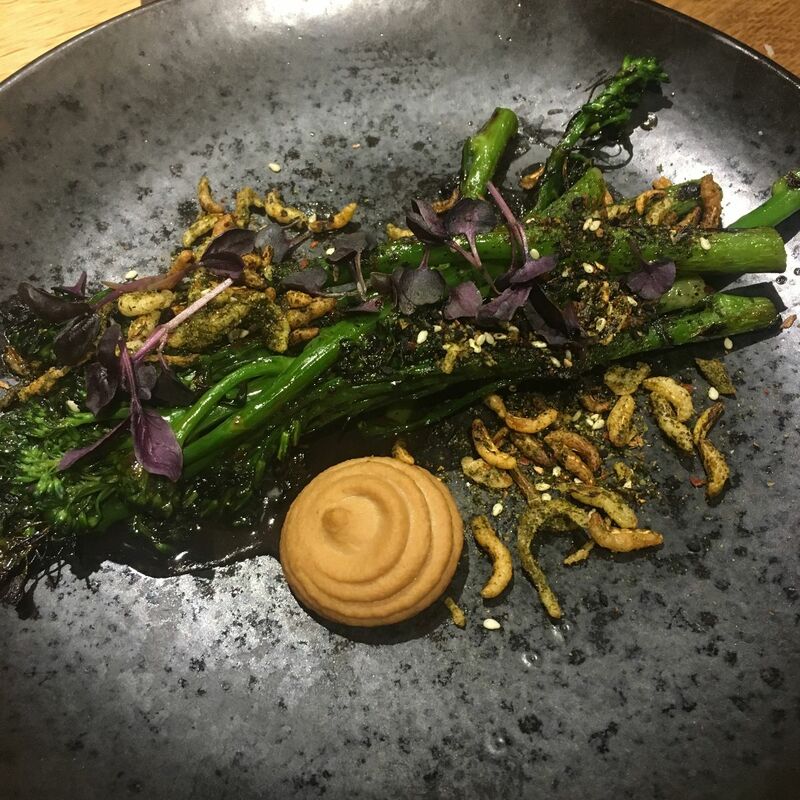 Purple Sprouting Broccoli was slightly charred from the fire, finished with a sprinkle of furikake and a rosette of peanut sauce (£8.5). Also delicious. 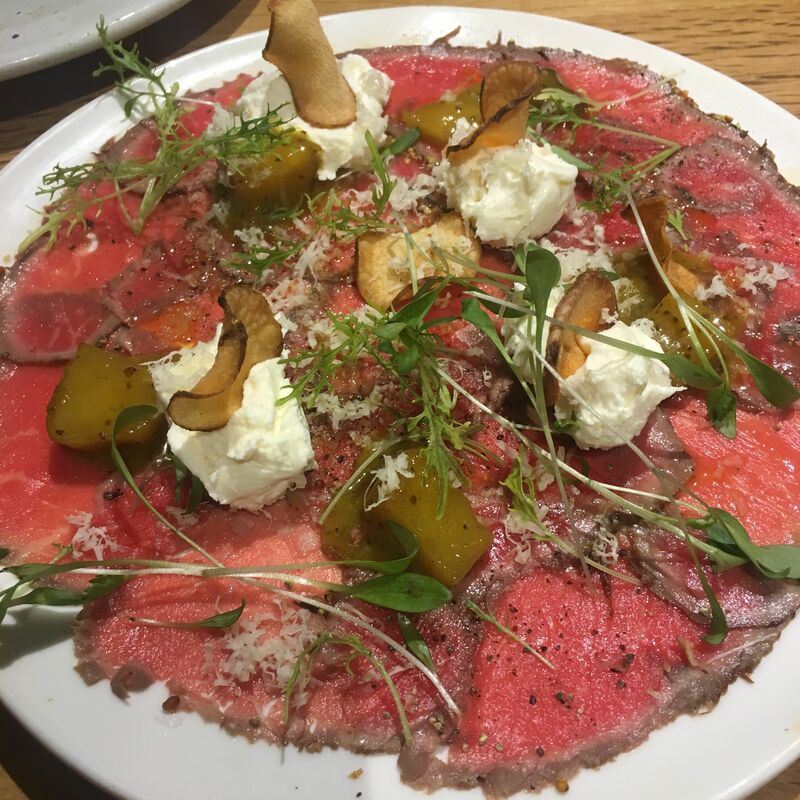 Though there are a few meat options on the menu, the only one we had was Grass-fed Beef Carpaccio, Jerusalem artichoke, Crowdie (£12.5).Crowdie is a soft Scottish cheese made from buttermilk or sour milk. 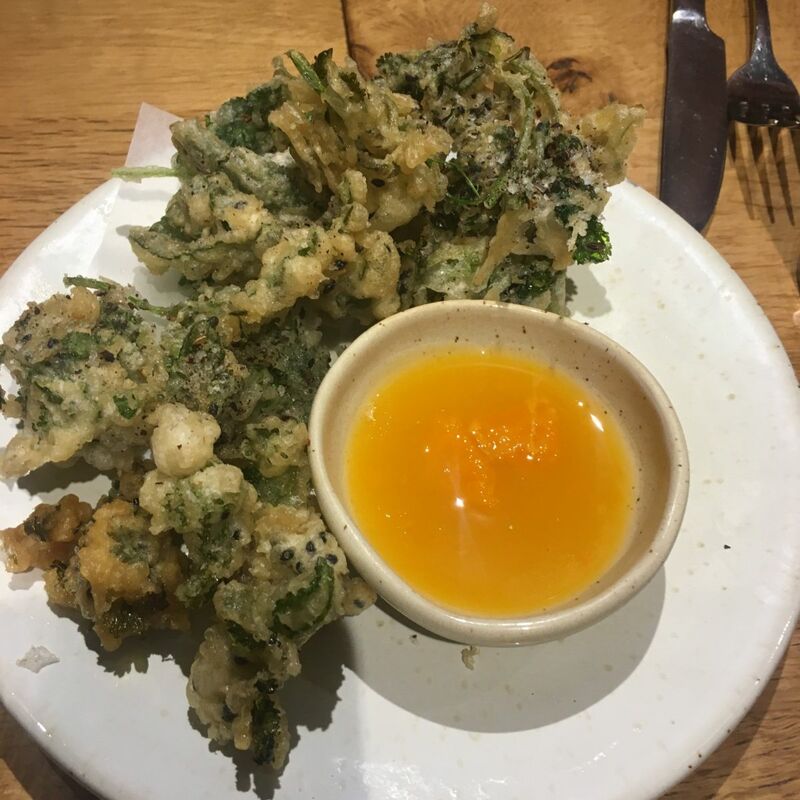 Its texture contrasted beautifully with the crisp discs of fried Jerusalem artichoke. The beef was just seared around the edges, which enhanced the flavour along with a scattering of grated parmesan. I neglected to take a photo of another dish, a sensational Celeriac Shawarma, bkeila, fermented tomato (£15) which somehow tasted quite meaty. It is one of the many Vegan options on the menu. 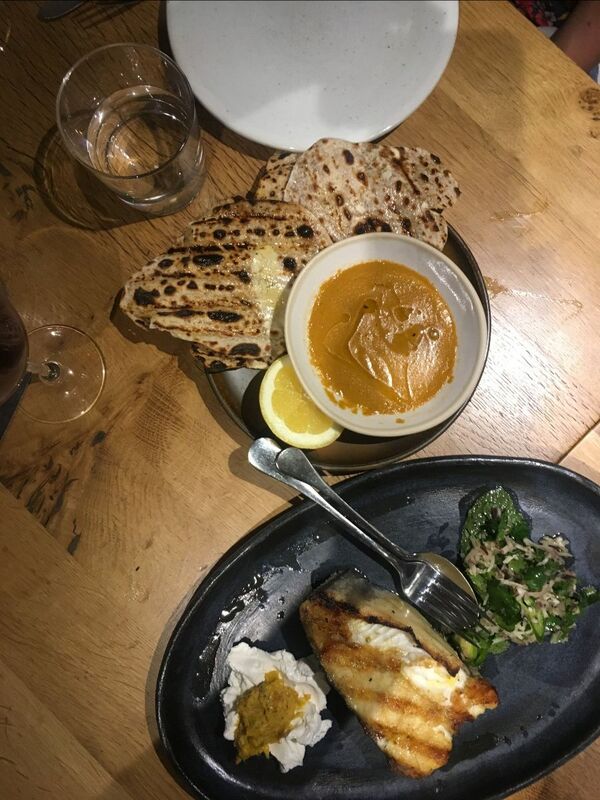 We chose entirely from the Nibbles and Small Plates offerings, including a wonderful dish of globe artichokes (£9), except for one main, designed for two to share: Grillet Halibut, smoked fish butter curry, coconut, einkorn roti (£54 for two to share). Halibut is not a fish I am familiar with, coming from cold waters, but it was superb, a thick white fish, beautifully cooked to a buttery texture. Outstanding. 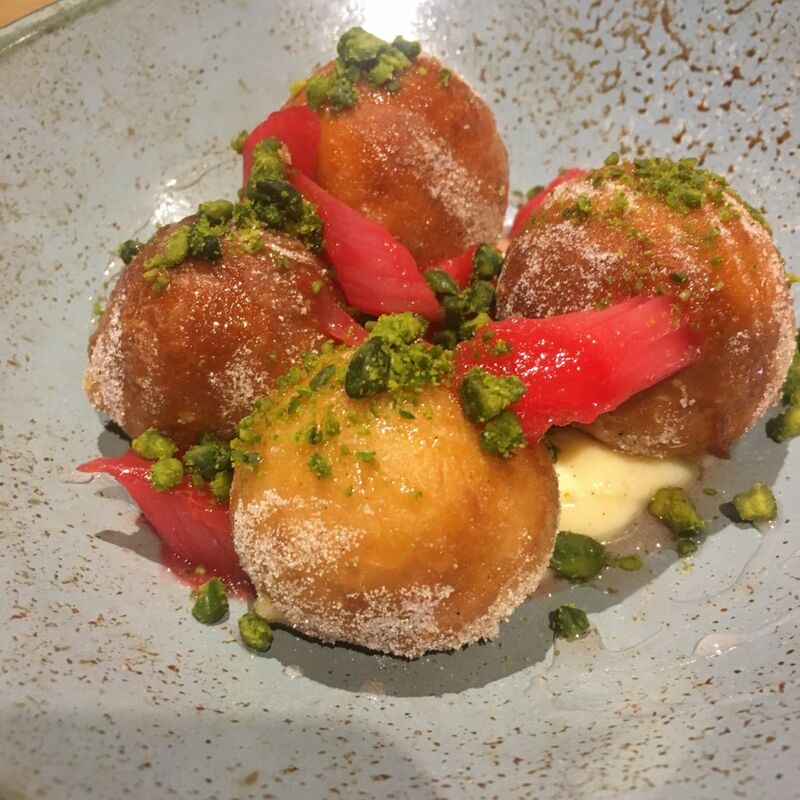 We finished with Rhubarb and rose doughnuts, vanilla cream, pistachio (£9) and Beetroot and chocolate fondant, chilli, crème fraiche ice cream (£9) which satisfied the sweet tooths amongst us. I loved the Miso caramels too (£4). I’ll be back. I’d love to try the rest of the menu, but would equally be happy to eat the same again. The service was fantastic and pleasantly, there is space between the tables making conversation easy. Full marks for not crowding in extra tables. 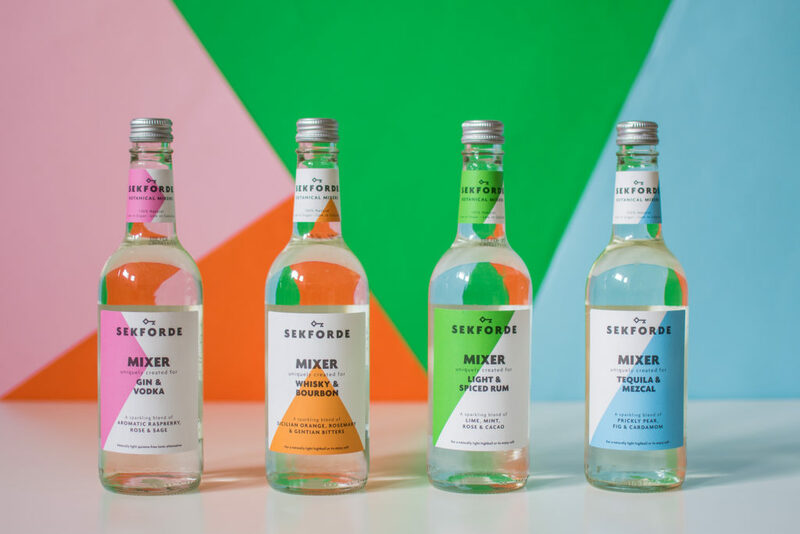 For launching a new range of spirit-specific mixers to enhance rather than mask the spirit they accompany. Can’t wait to try them,. 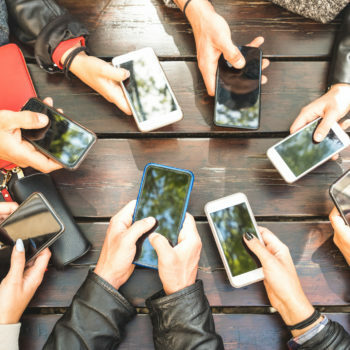 Samuel Smith’s UK pub chain has banned mobile phones, iPads and laptops from its pubs in an effort to reignite the art of conversation. Read the story here. And while I don’t indulge in April’s Food Day jokes, this is amusing The Best Drinks-Based April Fools in 2019. Do you have any wine apps on your phone? I mentioned restaurant awards like week, saying “love them or hate them”. Now In Food and Wine Gazette Andoni Luis Aduriz (whom we heard from at Paarabere) , chef of one of the most innovative restaurants in the world, Mugaritz, has warned that guides, lists and social media are all contributing to a lack of diversity in gastronomy to the extent that if chefs and restaurants want to be successful they need to follow a particular model and be the same. “Isn’t this colonialism, isn’t this imperialism?” Read Gastronomic imperialism: ‘Diversity is being killed by quest for success’ – Andoni Luis Aduriz and decide for yourself. How about trying 9 different wines all from the one maker, grape variety and region? Andrew Thomas aka Thommo is so committed to this signature Hunter Valley style that he’s made nine different wines from incredibly different single vineyards dotted around the Hunter Valley.Thommo makes only Semillon and Shiraz from the Hunter Valley and his flagship wine – Thomas Kiss Shiraz, is most certainly, his signature. Named for the mantra Keep it Simple, Stupid. He’s made wine in the valley first for his father and then for Tyrrell’s but when he planted his own vineyards they were only semillon and shiraz. Now producing more than 18 different wines from just these two varietals, it’s his single vineyard Shiraz wines that have now developed a cult following. It seems the ’17 was an exceptional vintage. 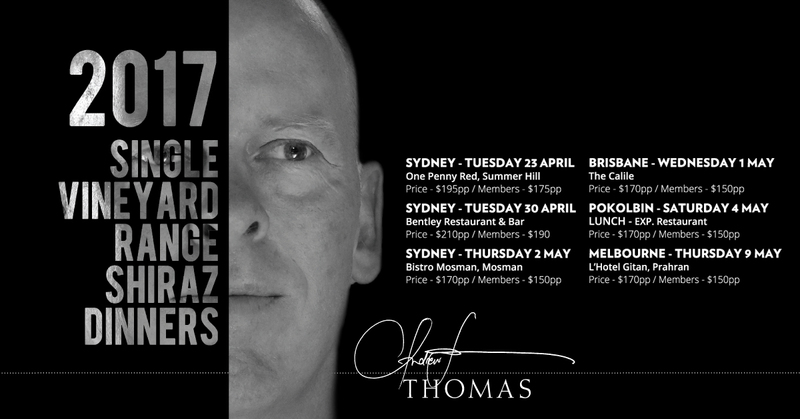 Thommo will be showing off the ’17 reds at a series of lunches and dinners. Pure Wow explains What’s the Difference between Kosher, Table and Sea Salt, Anyway? I’m sending this from Singapore and am looking forward to returning to Sydney in time for the Sydney Royal Easter Show where I am cooking every day at 3pm. I’m also cooking on Studio 10 an Ireland-inspired dish on Thursday 11th, so tune in.